Since then I’ve stitched some french knots on the lily of the valley and I’ve started stitching a few of the metallic high lights. The pattern supplied gold thread, however I felt with my change of background I’d be better with silver. I have to say I’m still not convinced, I’m debating whether or not to undo the silver and replace with a suitable floss. It’s also couched down with the silver thread which is fiddly. I’m tempted at the moment to just do back-stitch with coloured floss. I might decide after I’ve stitched more flowers so I can try both ideas out. I’ve also started the border, I’ve almost stitched three swirls and there are thirty-two altogether! This is why I’m trying to stitch them as I go along, rather than leaving them all to the end!! This stitch-a-long is organised by Avis from Stitching by the Sea, we post our progress on a project every three weeks, it’s a great incentive and motivator. If you would like to join us please contact Avis. In the meantime please follow the links to see what everyone else is sharing. I’ll also be linking up with Kathy’s Quilts for Slow Stitching Sunday, please follow the link to see lots more hand-stitching. 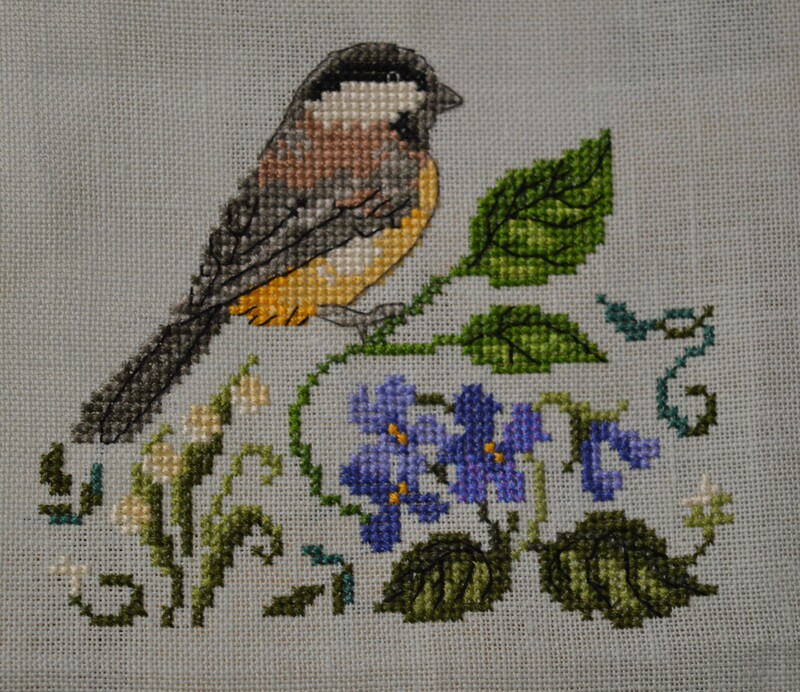 This entry was posted in embroidery, Stitch-a-long and tagged cross-stitch, Stitch-a-long, The Finery of Nature. Bookmark the permalink. I love your bird just the way it is. I really admire your talent. Very beautiful! The metallic highlights add wonderful sparkle to your picture. My grandmother had lily of the valley in her garden. I always think of her when I see it. He looks great – and such a lot of progress! He looks so beautiful and delicate. It’s going to look fantastic with that border! That border is a great addition, but I’m with you, 32 of those nonstop would be pretty awful! I like your idea of trying some colors for backstitching before you rip anything out. I’m not in love with the silver, but not sure why exactly, so I’m no help! Wow, that is gorgeous!! The background color choice is perfect too, I like that idea better than black. 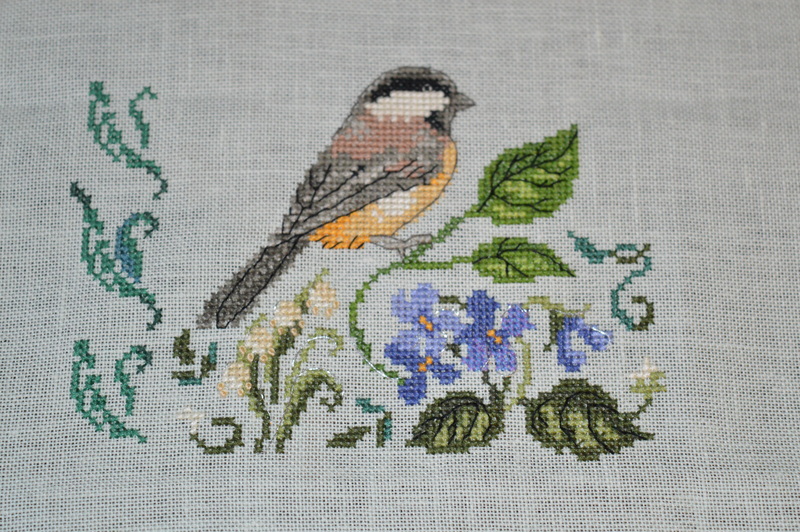 The bird is lovely and looks great on your choice for the background fabric. Lovely progress! Maybe try the gold highlights even though the background is lighter? Your cross-stitch is very pretty. I really like that bird and the pretty swirls. Such a sweet piece ~ The background color change was perfect! Love the border too. There’s something about pieces like this that have a botanical feel that I just love. Birds are just about my favourite thing in the world. Your stitching is lovely. Just gorgeous and makes me smile when I look at it – stitchery loveliness! You’ve made good progress. Hope you find you can live with the silver you’ve already put in – just so you don’t feel compelled to take it out! Wonderful progress! (I’d be stitching the border as I went, too.) This is beautiful. Lovely work. Great progress and a lovely bird!